Digital Performer for Engineers and Producers is designed to help people who already have some familiarity with Digital Performer - or any other DAW software - jump directly into some of the extremely important and powerful capabilities of this incredible software. Author and noted DP guru David E. Roberts has been directly involved with the development of this incredibly powerful and innovative DAW software since 1993; he is also responsible for artist/VIP support at MOTU and has been training new users for the past 20 years. 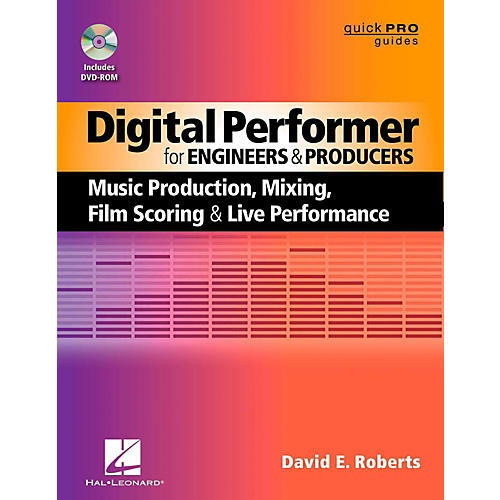 Considering Roberts' depth of understanding and insightful experience, this Quick Pro Guide offers a uniquely succinct path to understanding and eventually mastering Digital Performer. Digital Performer for Engineers and Producers focuses specifically on music production, mixing, film scoring, and live performance. This important resource helps the reader get right down to the essential tasks, providing insight, tips, and tricks that help the creative mind link existing knowledge to the important activities most commonly implemented by DAW users at every level. The accompanying DVD-ROM provides extremely powerful and supportive video tutorials featuring Magic Dave Roberts doing what he does best: revealing the insider tips and tricks that have kept Digital Performer at the forefront of DAW technology since its inception.